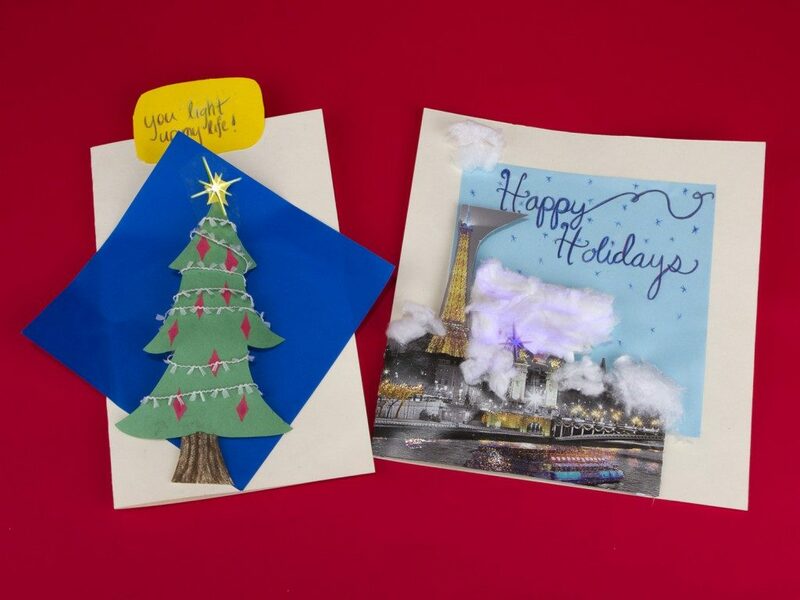 Light-up cards incorporate two of the best worlds of making (electronics and crafts) with the added bonus of making somebody smile. Heck yes! 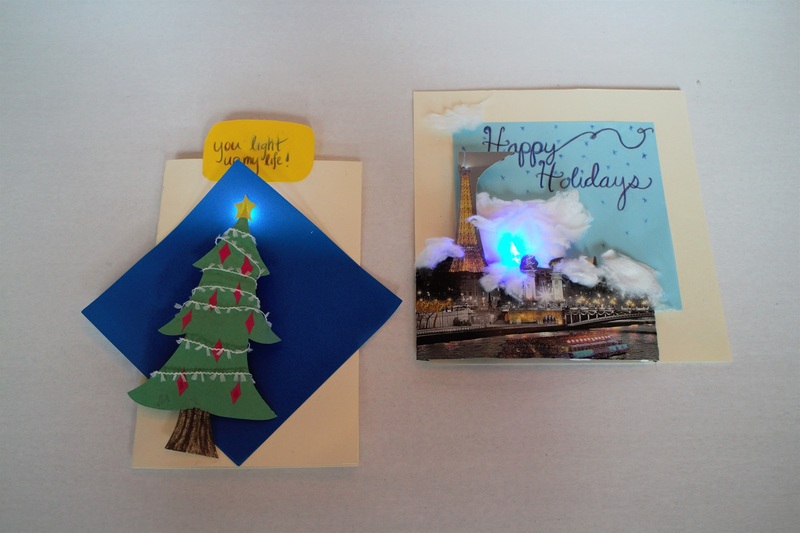 Here’s my approach to light-up cards and my favorite recent discoveries: pop-ups and cotton balls. Read time: ~ 5 min. & any other craft materials your creative heart desires! 1. 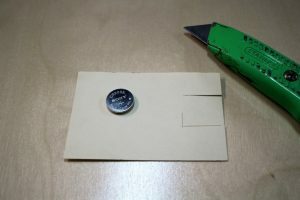 Cut out a pocket for the coin cell. 2. 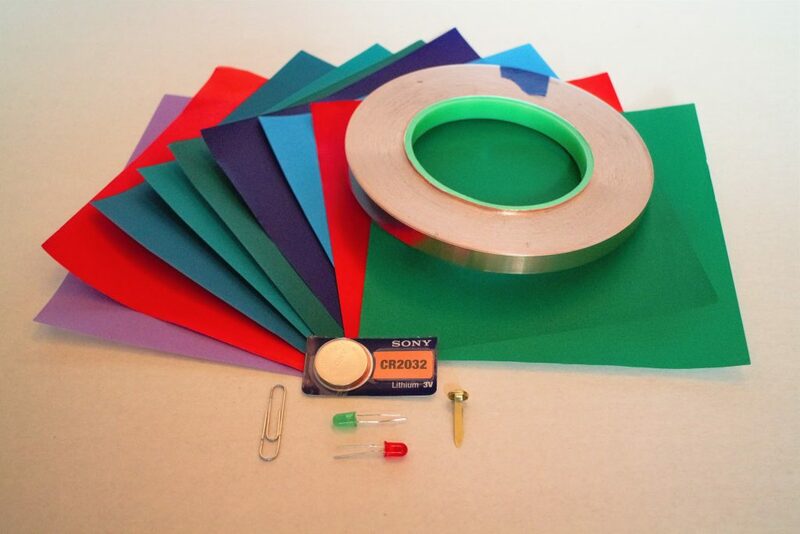 Add copper tape to cardstock! 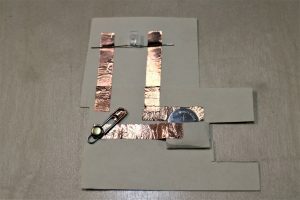 Stick 2″ of copper tape just above the battery pocket, so that the bottom of the battery rests on top of it. This is the negative (-) side of the circuit. 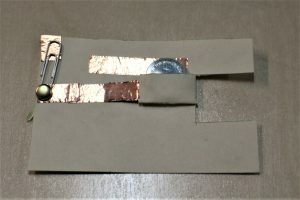 Stick another 2″ piece of copper tape on the underside of the pocket, so that it touches the top of the battery. This is the positive (+) side of the circuit. 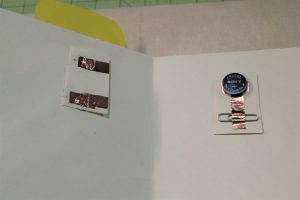 Cut a small line at the end of the copper tape, push paper fastener through the slit and hook the paperclip under the paper fastener (it might also help to add copper tape to the end of the paperclip). This makes an “on/off” switch! The longer LED leg connects to the positive side of the circuit. The shorter leg connects to the negative side of the circuit. 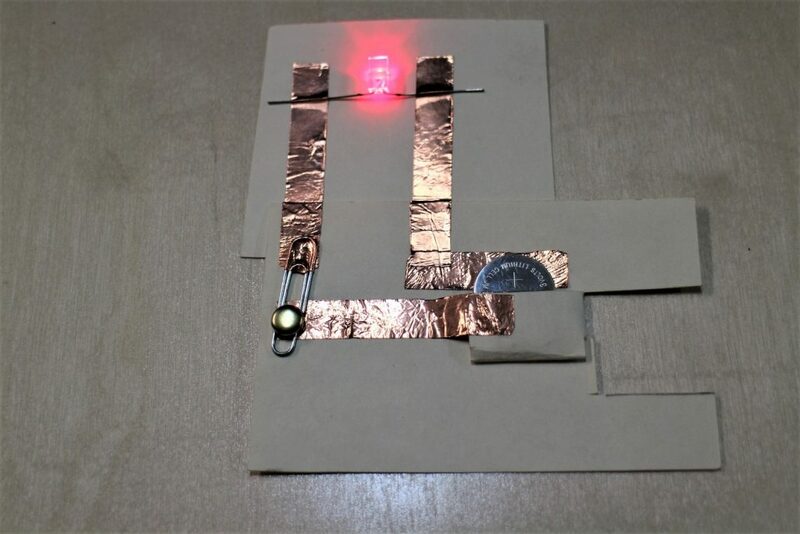 Be sure that these two sides of the circuit do not cross, or it “shorts” the LED and drains the battery. Design & Make the Card! 1. Plan out where the light is going to go! This is super crucial if you want the light to be in a specific spot, like the top of a tree, as a nose, etc. It’s helpful to make a super simple drawing of what you want before you try, or at least have extra materials on-hand for second (or possibly third) versions. Check all the things before you glue stuff down. Since it’s the December holiday season, I’m making a bunch of holidays cards for friends, woo! I like incorporating re-used (or upcycled) materials, so for this card I cut out the cover of an old calendar and folded the edges under to make it 3D (oooohhh now we’re gettin’ fancy!). Another fun option are pop-ups! Cut out thin strips (~ 1/2 inch) and fold them accordion-style, then use ’em to prop up your cutouts and drawings! 3. Add in the LED! 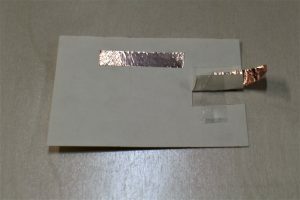 You can either hide the circuit under the cover, or inside the card. 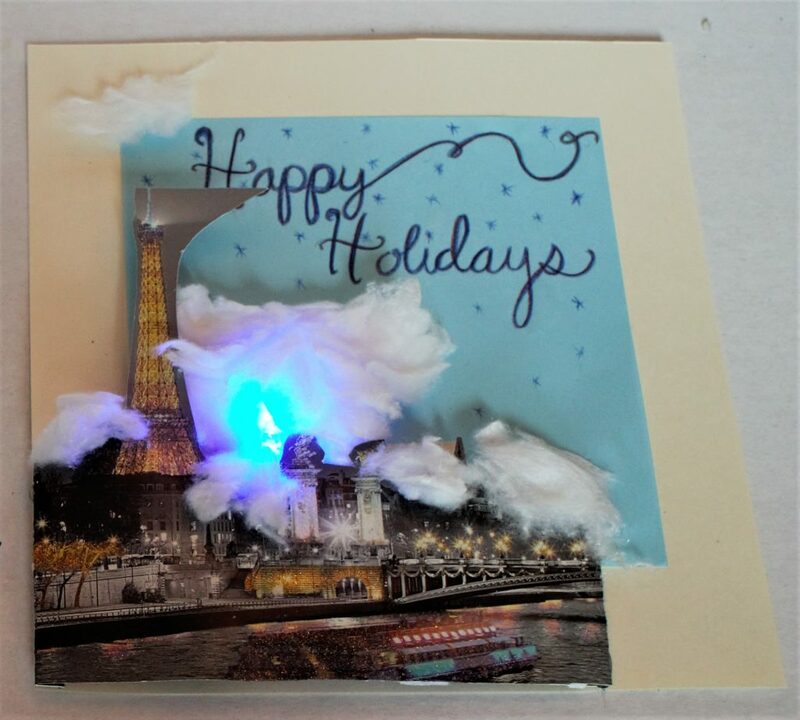 For this card, the circuit slips under the cut-out, and the LED, covered by a lot of cotton balls, sticks out the top to light up the clouds! Close the switch to the LED and stand in awe at your awesome creation! Write a heart-felt note on the inside and give it to your favorite family member/friend/coworker/neighbor/etc!! 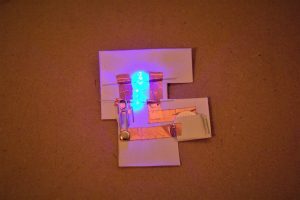 ← Make a Sneaky Wearable ‘State Change Switch’!